I am a day late posting this. Things have been super hectic around here with school starting, but with the kids off to school this morning things have settled a bit. 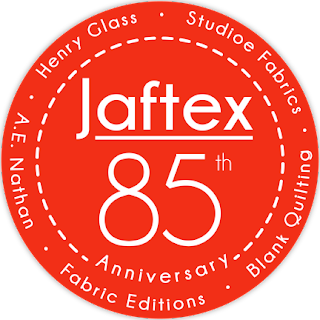 Jaftex Corp. was founded in the 1930’s when Jacob A. Fortunoff started selling fabric on the streets of New York. At that time, the mainstay of the business was women’s sleepwear and lingerie. In the 80’s, Jacob’s grandson, Robert, dramatically changed the business of the company. The business focus was transferred to the over the counter quilt industry when Robert purchased companies like A.E. Nathan, Henry Glass, Stylemaker, Chanteclaire, Fabric Editions/Studioe and more recently The Blank Quilting Corp. Robert is now joined by his two sons, Scott and Greg. Scott currently is the President of Studioe Fabrics, The Blank Quilting Corp. & A.E. Nathan Co., Inc. Greg just joined the business in late 2014 and has successfully spearheaded the company’s foray in to precut fabrics among other contributions. There will be lots of great prizes in addition to the prizes on the Gleam widget below. Visit each blog below on the specified day to enter and come back here on September 11th to see my project and enter for your chance to win a fat quarter bundle of Peppered Cottons. September 29 - Jenny @ Martingale& Co. Interesting fall leaves....I love the peppered cottons. They really change the look from using solid cottons. I know that this is a day too late but wanted to thank you for being in this contest. Moving is such hard work before and after actually moving. I'd make a table runner and placemats! This is the coolest blog hop ever! I first spotted this blog hop today! Where have I been these past weeks? Oh, right, classes have begun. These quilters have used these marvelous fabrics so well. I have bookmarked a number of them. Thank you and Happy Anniversary!